A breakthrough and naturally-derived alternative that dramatically improves the appearance of skin to help you achieve a clear, bright porcelain complexion. Sun exposure and skin ageing can cause an uneven production of melanin in the skin that can result in the appearance of freckles, sunspots, age spots, pigmentation or an overall darker skin tone. 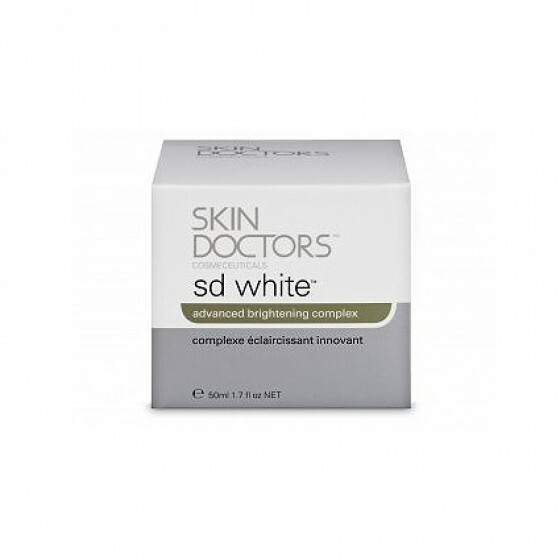 SD White contains an optimum dose of Emblica a plant extract scientifically proven to dramatically improve the appearance of darker skin pigmentation. Phyllanthus emblica - Also known as Emblica or Indian Gooseberry, this plant is native to tropical Southeast Asia. It is a skin-lightening, pigment-reducing agent, giving skin a bright and even colour. Emblica is also a potent anti-oxidant, eliminating free radical damage to the skin, helping to achieve a youthful appearance. After cleansing, gently massage a small amount evenly all over your face and neck. Follow with daily or nightly moisturiser. Application : For best results use twice daily, morning and evening. Review "Skin Doctors SD White"